Kathleen lives in the North End and is truly a North Ender. She has lived in the same house for 30 years! She shares her home with her dogs Iris and Flynn, and two finches. She also owns a horse which she boards in Star. 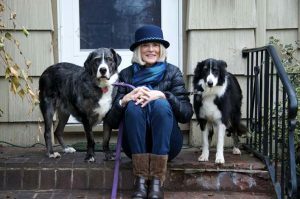 Kathleen is a true animal lover who began pet sitting after she retired from her civil engineering job with the Department of Transportation. Kathleen has been a client of The Pet Sitter of Boise for many years, so when were delighted when she decided to work part-time for us. An animal lover her entire life, Kathleen takes great pride in her work and truly loves each pet she cares for. She spends quality time with each one, getting to know their individual personalities. She is trustworthy responsible, and compassionate towards the pets she cares for. Kathleen also loves running and she will run dogs upon request. We are proud to have Kathleen on the team!